DVD Wall Mount makes your TV and DVD setup much more organized. You can setup your DVD or other players beside your TV screen, mounted on the wall, without taking up much space. 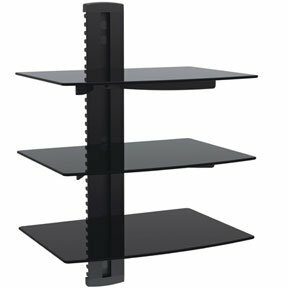 We have Aluminum/Tempered glass DVD wall mount available in single deck, double deck, and triple deck for multiple uses. You can choose one meeting with your requirements and needs. We also have variety in folding DVD wall mounts. All our products are quality checked before they reach you and are up for after sale services. You also get lifetime technical support on all the products ordered from SFCable.